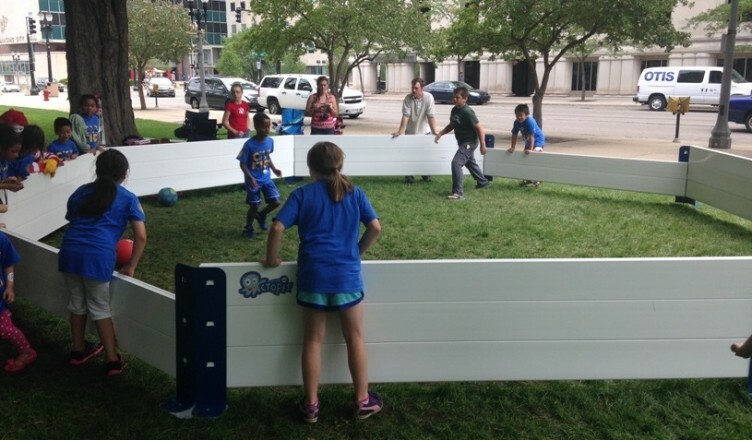 Octopit USA gaga ball court: Of course, the first thing to do is to buy an Octopit USA gaga ball court and set it up in an ideal spot. If the fundraiser is outside, make sure it is a flat surface, free of any potential tripping hazards. Gaga ball is an exciting game that requires a lot of movement so make sure the space is hazard free! Advertise: Create flyers promoting the tournament and make a fee to enter to raise funds! You can organize teams if it is a big group or make it every man for himself. Rules: Establish the rules and a referee beforehand. There are many variations of Gaga ball and you can definitely customize the rules! Refreshments: Since Gaga ball is a very active game, it is important that snacks and water are available for the participants! A great way to save money is to make it a potluck and ask everyone to bring a little of something. Fun: This is the most important thing you need for the tournament. Bring the community closer together with a Gaga ball tournament! The day will be filled with excitement and joy…we guarantee it! Find out more about our top quality Gaga ball pits and order one today at OctopitUSA.com!